This page is here to help you share TWiDI with the rest of the neighbourhood/cul-de-sac/country/world/universe depending on your interest for this webcomic, or maybe just for networking purposes. Right click, select copy image location/view image and copy the url in the address bar, and replace IMG URL in the box below with the url you just copied. For the image alignment, you can select placing it to the left, centre or right of your page, or remove it completely for FREESTYLE. I’ve created an easy-to-reblog system. You can just instantly go to the links provided in the new post so you catch up, and if you want, reblog it to share with your followers. You’ll have to endure my tweets about ridiculous things like election flags ruining the landscape and driving school, but what do you expect out of an 18 year old? 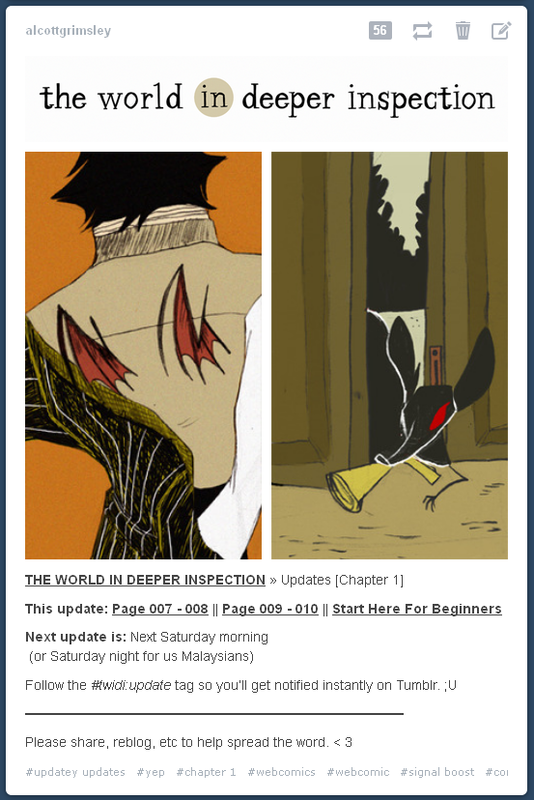 I have trouble updating it sometimes since I’ve established a pretty big Tumblr blog full of inspiration and relevant articles/info/pictures for the webcomic. Also I’m a fan of Tumblr. I’m not very hard to find generally so it’s like, eh, may as well. I only accept your friend request if you’re an artist and have samples of your work in your photo album or provide a link to your art blogs/portfolio in your About Page OR if you’ve more than one mutual friend. This is mainly for my own protection.